stillspotting ( ) nyc: finale. Photo courtesy of Christina Yang, copyright Solomon R. Guggenheim Foundation, 2012. Last Tuesday, October 9, was one of those impossible days on the subway: train after train screeched to a momentary standstill, doors opening to reveal cars crammed with people, faces flushed, bags clutched to their chests. After the third packed 6 train pulled away from the platform, I gave up and climbed the stairs to the street to hail a cab uptown. When I entered the Peter B. Lewis Theater at the Solomon R. Guggenheim Museum, I was greeted not with the silence and stillness I expected, but with a cacophony. Rhythmic drones, whirs, clucks, and shrieks swelled in the space, increasing in pitch, volume, and tempo. As guests trickled in to fill every seat in the living room-like theater, I closed my eyes and tried to distinguish each layer of the riot, to peel the organic from the mechanical sounds, until I felt dizzy from the sonic overload. The sound—the work of Brooklyn-based composer Sergei Tcherepnin—eventually receded, leaving the audience to their own quiet murmuring. David van der Leer, Associate Curator of Architecture and Urban Studies for the Guggenheim, took the stage to commence the evening’s “variety show.” Billed as a collection of “performances, films, readings, statements, and personal reflections by architects, artists, planners, scientists, politicians, philosophers, and musicians,” stillspotting ( ) nyc: finale celebrated the completion of a two-year-long multidisciplinary project launched by Van Der Leer and the museum. Van Der Leer, who hails from the Netherlands, at first experienced deep frustration with the city’s noisiness upon moving to the metropolis. As an antidote to what can be a deafening soundscape, Van Der Leer launched stillspotting, a series of five installation and experience pieces staged in each of New York’s five boroughs. From Manhattan to Staten Island, Van Der Leer dispatched artists like Pedro Reyes—whose Brooklyn stillspot entitled Sanatorium amounted to a pop-up “urban therapy” clinic—to transform urban spaces into places of quietude. Andy Battaglia, one of the night’s speakers and an organizer of Unsound New York, the U.S. offshoot of the experimental music festival in Krakow, referenced John Cage in his introductory notes. The parable of Cage’s experience in the anechoic chamber, during which the musician heard not the silence he sought but rather the hum and buzz of his own nervous system, raised vital questions to be explored throughout the evening. Is silence a myth? Can we, or should we, distinguish between silence and noise? Moreover, are silence and noise endowed with moral value? “Silence is imaginary; noise is real,” Lawrence Kumpf, co-curator of Unsound, wisely noted. More provocative were the musical interludes that peppered the program. David Suisman’s compilation of the late sound archivist Tony Schwartz’s audio documentary works provided a welcome counterpoint to the PSA-like lectures. “Listen to the musicality of the voices, the color and richness of the timbre of people’s voices,” Suisman advised the audience before playing On Schwartz #1, a “sound collage” of people speaking on the subway. Taking Suisman’s advice, I attempted to appreciate each speaker’s voice like one would listen to instruments in an orchestra. The effect was beautiful: the voices lilted, rasped, and flowed in succession—some honey-warm and full, others chilling and sharp. Recalling my less-than-inspiring experience with the 6 train, I couldn’t help but smile. The cacophony of public transportation that seemed intolerable now sounded almost mellifluous. Writer and scholar of Indo-Tibetan philosophy Robert A.F. Thurman spoke to this change in perspective I experienced upon listening to Schwartz’s work: “you have to give yourself over to the sound,” Thurman advised, “Let it resonate in your heart, in your brain.” Before leading the audience in a practice of “mindfulness meditation,” Thurman told Buddhist tales that warned against considering noise and silence in rigid terms, as binary states at opposite ends of the sound spectrum. The individual’s perception of whether a sound is unbearable or pleasant is entirely subjective, and endowed with no real moral value. New York City can have a happy buzz or an excruciating clamor depending on one’s situation. Thurman encouraged the audience to seek “internal stillspots” through meditation. Sarah Williams, who creates digital maps of NYC’s 311 noise complaint calls, spoke directly to my sentiments. “After all, we all live in New York for a reason,” Williams said. To some degree, we must enjoy the noise if we continue to call this city home. Upstairs in the rotunda, guests sipped Pastis and crème de menthe, the “stillspotting cocktail,” consulted with volunteers in lab coats playing the roles of “urban therapists,” and created “goodoo dolls”—a beneficent version of the voodoo doll. 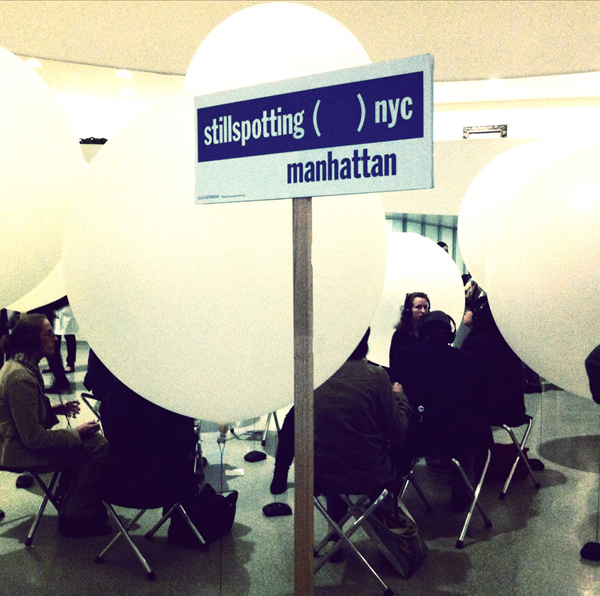 Inside the restaged stillspotting: manhattan (a sanctuary partitioned from the space by giant white balloons), listening to Arvo Pärt and Snøhetta’s Hymn to a Great City through headphones, I reflected not on the evening’s moments of stillness or silence, but on its fragments of ecstatic sound. By “stillspotting,” maybe we can regain some love for the music that surrounds us when we venture out into the city each day. Reviewer Carlos Brillembourg finds the absurd task of representing 500 years of Brazilian history in a single exhibit further hampered by Jean Nouvel’s Guggenheim redesign and the franchising of the museum brand. Art in a time of rapid change.